This book review was shared by Jan Resseger, Minister for Public Education of the United Church of Christ Justice and Witness Ministries and chair of the National Council of Churches Public Education and Literacy committee. 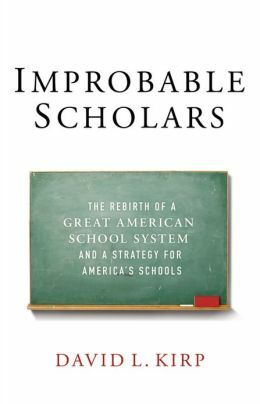 I was up late last night reading Berkeley professor, David Kirp’s new book about school reform in Union City, New Jersey: Improbable Scholars: the Rebirth of a Great American School System and a Strategy for America’s Schools (Oxford University Press, 2013). “Union City ranks sixty-first nationwide in its concentrated poverty…. It’s also the nation’s most crowded municipality.” Virtually all students are Latino-Latina, many recent arrivals and a sizeable percentage English language learners. And yet, teachers, administrators, and students are all working hard—and strategically. Test scores reflect a transformation in the district in recent years. Kirp confronts the public education rhetoric war directly. He spent a year in Union City immersed in classrooms and the way the district works, and he shows us a school system where the emphasis is on improving instruction, connecting with and supporting each student, experimenting with bilingual education, supporting teachers—many of whom grew up in this school district, and focusing way beyond the requirements of the New Jersey ASK standardized test. An academic, Kirp also presents the research that supports reforms being implemented in Union City. This is an inspiring book and one of the most hopeful books I’ve read in a long, long time. While it is an entirely secular book, it surely is appropriate reading for the Easter season. Kirp emphatically rejects the hubris embedded in today’s technocratic school reform where wealthy theorists are content to experiment with shattering neighborhoods and undermining the humanity of committed teachers with econometric Value Added Metric rankings based on students’ standardized test scores, VAM rankings that have sometimes been published in the newspaper. This is a book about people working every day to build human connections in a place where the public schools have, quite recently, become the heart of the community.